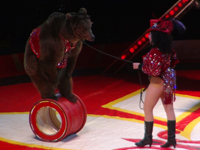 Animal Defenders International : Animals in entertainment : Massachusetts state bill introduced to prohibit wild animal acts. Massachusetts state bill introduced to prohibit wild animal acts. Massachusetts State Senator Bruce Tarr has introduced SD.2002 - a bill to prohibit traveling wild and exotic animal acts in the state. ADI was honored to work with Senator Tarr and local advocates on the bill, reflecting increasing public recognition that these acts are both cruel and dangerous. Join the global campaign to Stop Circus Suffering.